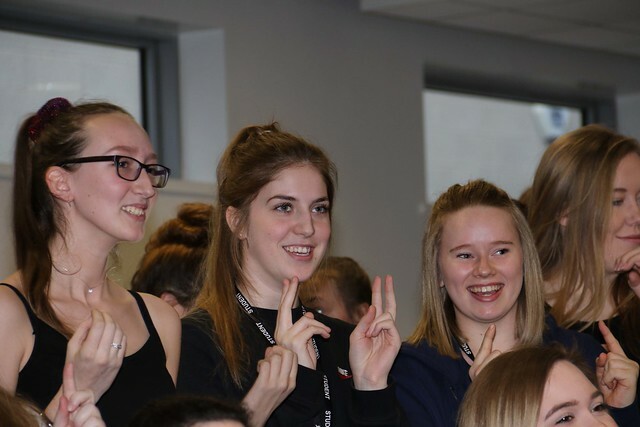 Home > News > Students Raised Hundreds of Pounds for a Deaf Charity After Learning How to Use Sign Language for a Special Performance in College. Students Raised Hundreds of Pounds for a Deaf Charity After Learning How to Use Sign Language for a Special Performance in College. Posted on 12th February 2019 at 12:10 pm. DARLINGTON College students performed Take That’s the Greatest Day using British Sign Language in support of the national Sign2Sing project. Deaf health charity SignHealth seeks to transform the lives of people through a host of projects funded by staging the only annual mass participation signing event in the country. More than 100 students and staff performed the song in front of their peers to raise funds and awareness of the plight of those living with hearing impairment. The event was organised by Darlington College senior lecturer in childcare Emma Clegg. She said: “I teach about children with disabilities and use BSL with students so we decided to support Sign2sing as a department.